Thumb web. That's what I call that stubborn spot between my index finger and thumb. It's the one place on my hand that stays ashy during the cold weather. I can't seem to keep it moisturized. It haunts me and forces me to keep a tube of lotion in my purse at all times. I have just the solution for this pesky skin problem. Carmex! 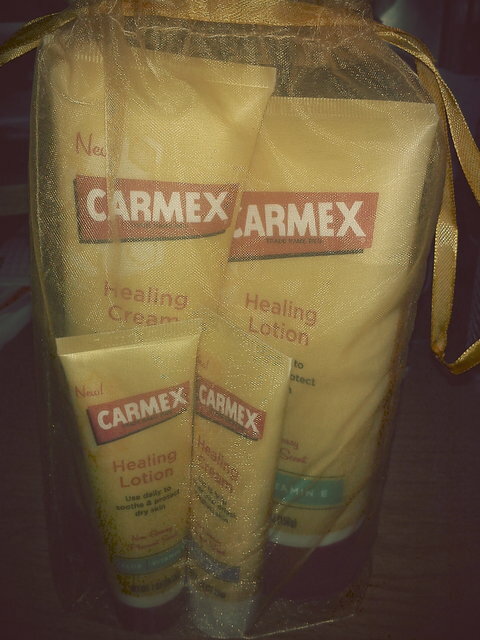 I've said it before and I'm saying it again– Carmex® Healing Lotion and Carmex® Healing Cream are wonderful. Although the weather has been great the last few days, it is still important to keep your skin moisturized and protected from the elements. Nothing is more unattractive than an ashy body part. I am always getting on my son to make sure he applies it when getting ready for school. I also make sure I am applying either lotion or creme to my skin as well. With such a trusted name such as Carmex, which has been around for over 70 years, it's easy to see why these products would get the job done. make the perfect stocking stuffers. I have a kit to giveaway to one of my lucky readers. TWEET this post using the button. Contest will end 11/28/2011 at 11:59 PM EST. Giveaway open to US residents only. You must be 18+. All additional entries are VOID if the required entry is not performed. A winner will be chosen using Random.org. Please leave an email address or other valid form of contact in your entry. You will have 48 hours to respond before another winner is chosen. Your mailing address cannot be a P.O. Box. For more than 70 years, Milwaukee-based Carma Laboratories has manufactured Carmex brand lip balm. 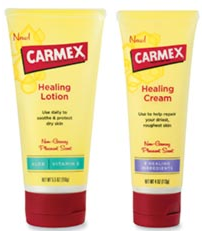 Carmex products are available at most U.S. retailers and online. For more information, contact Carma Laboratories at (414) 421-7707 or visit www.mycarmex.com. I was provided product to review as a member of the Carmex Blog Squad. There was no monetary compensation. Opinions and views are my own.